Working On New Patterns and I Need A Favor From You! While I was busy posting the Mini Safari Friends I've also been quietly working on these new patterns to release in October. It's been non-stop crochet since I got home from holidays! 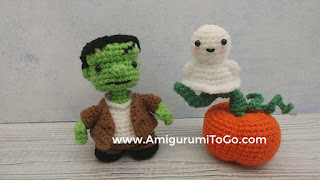 In the 8 years that I have been designing I've never had the opportunity to share any Halloween related amigurumi patterns of my own in time for Halloween! But not this year. This year I will have Frankenstein's monster, a ghost, and a pumpkin. I hope to have another one too but I'm not revealing what it is just yet in case I can't get it done in time. The other night my son and I tried to add highlighted posts with clickable links to my instagram. After about a half hour of frustrating failure we found out I can't add the links to the highlighted posts until I have 10,000 followers. I'm over half way there now, 5,652 followers, but a long way to go yet. Would you be willing to help me out? How about checking out my instagram and hitting the follow button. I would SO appreciate that. Thank you! Okay, that's all for tonight, I have to get back to work. Watch this blog. I'm going to have one of these patterns posted on the 1st! They look super, as always. Being born on Halloween i love anything spooky and can't wait to give these a try.